Categories: 4-20 mA, Digital, Output, Type Of Transmitter, Transmitters, ATEX Ex ia, IECEx, Input, RTD, Isolation, Unisolated, Measuring Channels, 1 Measuring channel, Design, Head Mounted. 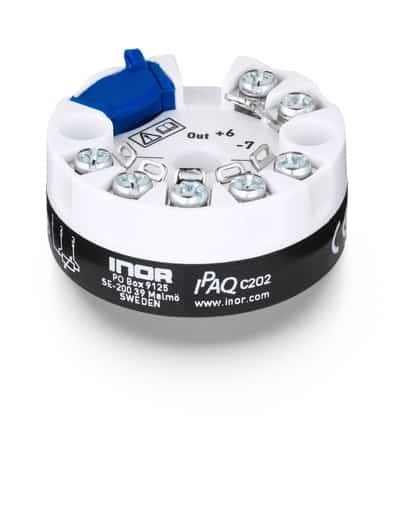 IPAQ C202 is a digital, easy-to-use temperature transmitter developed specifically for measurements with Pt100 sensors. Its robust design and high quality gives excellent performance and accuracy also under harsh conditions. With the new runtime counter function you can easily supervise the elapsed operational time between calibrations. The IPAQ C202 is also available with ATEX and IECEx certificates making it suitable for a wide range of applications. IPAQ 202 can only be configured with the latest version of ConSoft and USB inteface. Please visit our software page to download the latest versions.